There can be few musicians more influential than Roger Waters. From his work with the psychedelic progressive rock band Pink Floyd to his excellent solo records, Roger Waters has produced music which has touched the hearts of millions and cited by many of the greats as a massive source of inspiration. Join Roger Waters for an unmissable show. He takes over Hyde Park in the very heart of London for one of the biggest concerts of the year. Make sure you book yours before they all go! Roger Waters tickets become available at 09:00 on Friday. Rory Graham became an overnight sensation with his huge hit single ‘Human’ which appeared on his No. 1 hit album of the same name which has become one of the best-selling debut albums of recent years. But you might know him better as Rag N Bone Man. Having sold out all his dates for this year, Graham has just announced another very special London show taking place at Alexandra Palace on Thursday 8th of March 2018. This will sell out so make sure you set your personal reminder right now! Rag N Bone Man tickets become available at 11:00 on Friday. From their humble beginnings as a three-piece band playing wedding receptions to becoming the world famous anthemic Celtic rock band, Runrig have grown into a truly special act beloved by many. So, it comes with a great deal of sadness that they have made it known that they are bringing the group to a close. Celebrate the phenomenal band’s climax with a final farewell concert taking place at the idyllic City Park Stirling on Saturday 18th of August. Runrig tickets are currently available. Having now run for over ten years, Gate to Southwell Festival is well established as a creative hub exhibiting the very best in roots and acoustic music. Offering an eclectic mix of big names with rising stars, there is something to satisfy all tastes of everyone attending the four days at Southwell Racecourse. Tickets have been released for next year’s event. Expected to sell very fast, make sure you get your ticket for Gate to Southwell Festival before they all get snatched up. 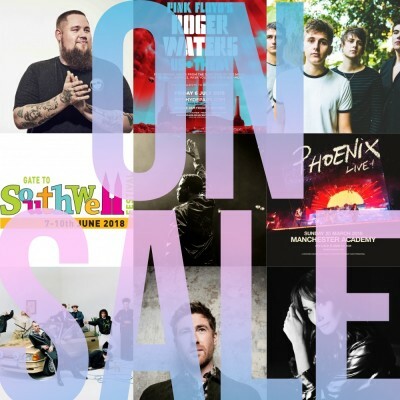 Gate to Southwell Festival tickets are currently available. Razor sharp comedian Chris Rock went from stand up in local clubs to widespread fame after becoming a regular on Saturday Night Live, going on to become an international star appearing in major films and taking home three Grammy Awards. Chris Rock adds further dates to his ‘Total Blackout’ tour, now appearing at Cardiff Motorpoint Arena and Bournemouth International Centre in addition to his shows at Manchester, Leeds, Nottingham, Glasgow and Birmingham. Chris Rock tickets become available at 10:00 on Friday. The Sherlocks head out on tour to promote their stunning debut album ‘Live For The Moment’. The Bolton band are known for their boisterous live performances and have been hotly tipped by the likes of NME, BBC 6Music and many lauded critics. The Sherlocks tickets become available at 09:00 on Friday. French rock band Phoenix have proved be one of the most exciting bands to arrive in a generation. Following the release of their latest album ‘Ti Amo’ last year, they now head to the UK to show off their new material at Manchester Academy. Phoenix tickets become available at 09:00 on Friday. With demand for The Sherlocks, Phoenix and many more of our shows being so high, we really recommend that you place yourself ahead of the rest by setting a personal reminder with Gigantic right now. This means you will be alerted with a text message or an email as soon as your chosen event becomes available. Nottingham’s biggest and best music event is upon us, once again. Hockley Hustle unites the many fantastic venues found in the bohemian area of Hockley for a day celebrating the very best of local talent with live gigs, DJ sessions, art displays and many surprises we are not allowed to say but cannot wait for you to enjoy. Hockley Hustle is proudly sponsored by Gigantic. Hockley Hustle tickets are currently on sale. Owing to its roots as a private party for just 100 people, Chagstock has grown into a fantastic music festival with a warm welcome for all. Each year it plays host to a great line-up and quickly sells out! Chagstock tickets are available from 09:00 on Friday. Held at Barn Farm Campsite in beautiful Derbyshire, Bananallama is already on sale for 2018. Offering brilliant music with an incredible atmosphere, we highly recommend this festival. Bananallama tickets are currently on sale. Insert coin for Ready Player 3. The live event includes playing sessions featuring Game Grumps and Jacksepticeye where they will discussing the latest releases, upcoming exciting games and cracking jokes. They will also open the floor up to a Q&A session where you will be invited to join in - Everything a gamer could possibly be interested in! Take the whole family on a magical journey when book for Disney On Ice presents Passport to Adventure. The wonderful experience includes a voyage to the wonderful worlds of Disney’s The Lion King, The Little Mermaid, Peter Pan, and Disney’s Frozen plus guest appearances from all your favourite Disney characters.